Whoa. Put on your sunglasses. 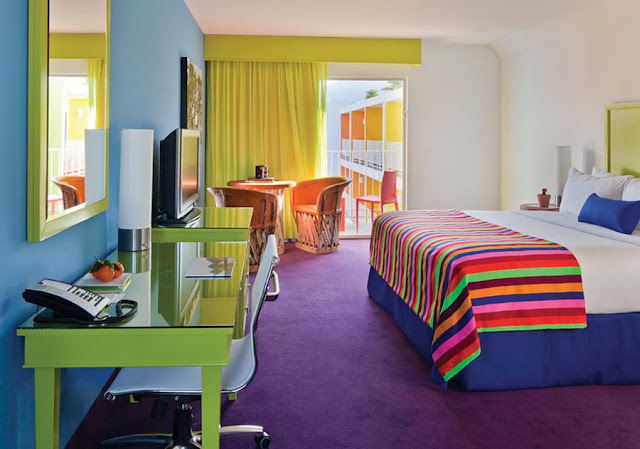 The Saguaro in Palm Springs, California is all about mixing the brightest brights, from neon green to deep purple, and everything in between. You either love it or hate it. For me, it’s love. I think this is exactly what a hotel should be. Sure it’s nice to have a calm, quiet oasis of a bedroom at your own home, but when you’re on vacation, I say live it up and do something 99% of you would never consider doing in your own house. It’s completely over the top and crazy, and that’s what makes it so much fun for a weekend getaway. In smaller doses, decorating in bright colors is actually easy and fun to do in your own home, even if you’re a little color-phobic. The bright striped throw would look really cute over the arm of a solid-colored couch. And the neon green table in a white-walled home office would be a great way to bring in a pop of color — and keep you awake at your desk! The key is to keep the lines really simple and clean with modern and mid-century-inspired furniture and generous amounts of white mixed in. What do you think? Could you sleep in a room this bright? Would you ever bring any of these colors into your own home? …And how much do you want to visit Palm Springs right now? Does this view of the pool help you make up your mind? YES, PLEASE! Ugh, I want to go sooooo badly! Can I still be inspired by weddings when I’m already married? 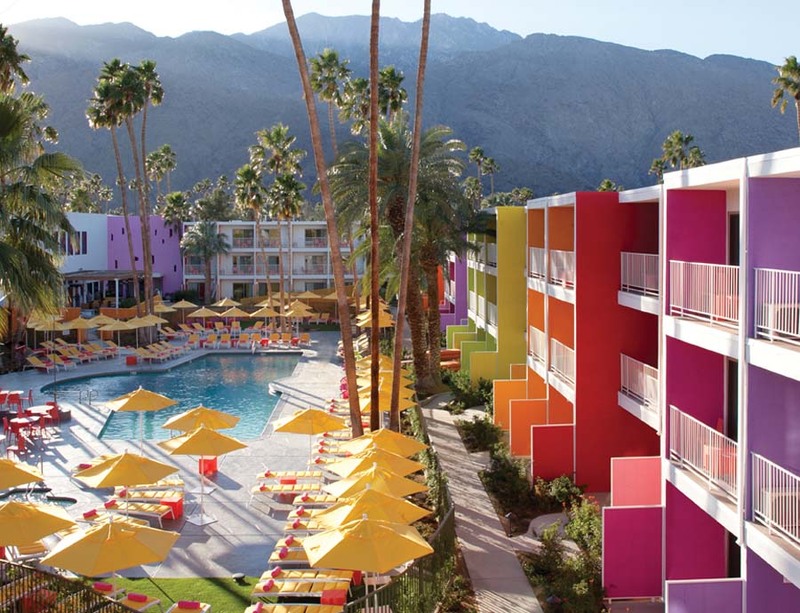 I’ve been to Palm Springs once but wasn’t able to take advantage of all the amazing hotel designs and perfect lounging-with-cocktail-in-hand-in-a-stylish-hat pool situations. Let’s get the guys and meet there sometime! I’m in. Fall 2013. I hear it’s nice that time of year!